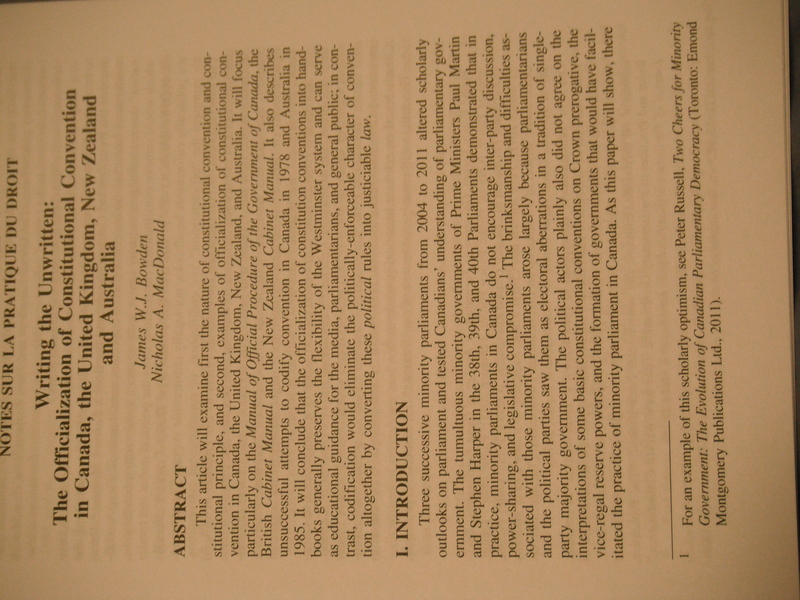 The Journal of Parliamentary and Political Law has released volume 6, issue 2 of August 2012, which contains six articles on constitutional conventions by the Rt. Hon. Joe Clark, Hugo Cyr, Andrew Heard, Heather MacIvor, Peter Russell. This article will examine first the nature of constitutional convention and constitutional principle, and second, examples of officialization of constitutional convention in Canada, the United Kingdom, New Zealand, and Australia. It will focus particularly on the Manual of Official Procedure of the Government of Canada, the British Cabinet Manual and the New Zealand Cabinet Manual. It also describes unsuccessful attempts to codify convention in Canada in 1978 and Australia in 1985. 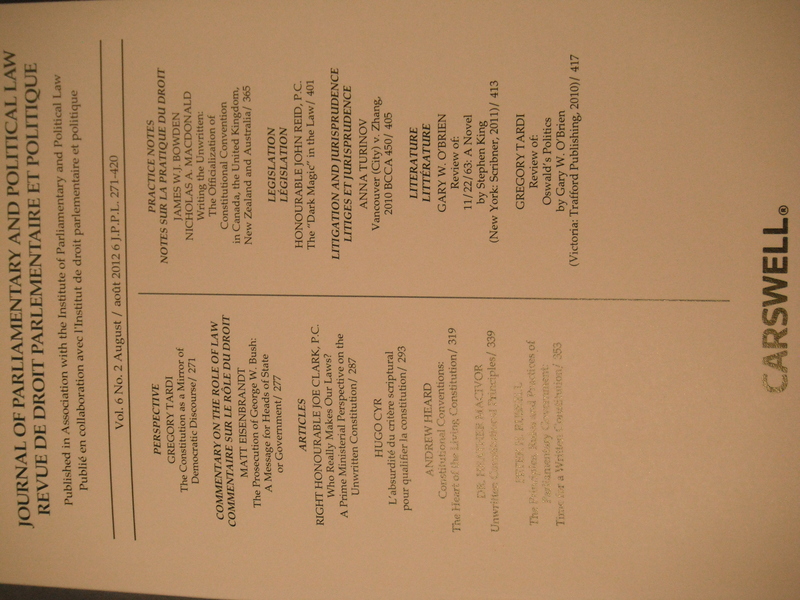 It will conclude that the officialization of constitution conventions into handbooks generally preserves the flexibility of the Westminster system and can serve as educational guidance for the media, parliamentarians, and general public; in contrast, codification would eliminate the politically-enforceable character of convention altogether by converting these political rules into justiciable law. I’ll post the link to the PDF if or when it becomes available. For now, I’ve uploaded some photos as evidence. This entry was posted in Constitution (Conventional), Officialization of Convention and tagged Andrew Heard, Heather MacIvor, Journal of Parliamentary and Political Law, Nicholas A. MacDonald, Peter Russell. Bookmark the permalink. James, do you know how to access this journal without having access to a university library? I am having a heck of a time trying to get my hands on this and it sounds like wonderful reads all around.